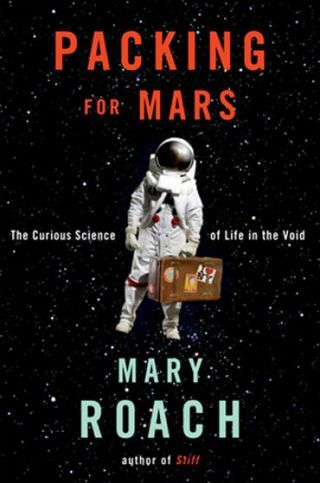 "Packing for Mars" by Mary Roach. Thenew book "Packing for Mars," by Mary Roach, arrivesat a time when the future of U.S. manned space travel liesat a crossroads. Despite the title, the book doesn't chiefly outline aproposedmanned mission to Mars. Instead, it delves into the minutiae of humanspaceflight. Itmight serve as a good primer on thesubject for novices, with amusing anecdotes that entertain, though mostof thematerial may come as a rehash for long-time space enthusiasts. NASAhasset the spaceshuttle program to retire in 2011, and Congress is discussingthe agency's new plan to visitan asteroid by 2025, and also to use privately built spacetaxis (oncethey're available) to fly astronauts to the InternationalSpace Station. Because of its timing, Roach's book has anopportunity to reignitepublic interest in the topic. "Packingfor Mars" (published Aug. 2 by W.W. Norton) stands poised for long-termsuccesslike previous outings by Roach ("Bonk," "Spook," and "Stiff").The author tends to fix on the freakish, absurd aspectsof space exploration, which will likely prove entertainingfor a generalaudience, but may dilute someof the book's impact for die-hardspaceflight fans. Eachchapter focuses on a specific aspect of space travel. Longtimefollowers willlikely find most of the topics familiar: astronaut selection, isolationtesting, animal test subjects and zero-gravity parabolic flights. Onecan'tfault Roach's research, as she trekked to many places even the mosthardcorespace fan would find difficult to reach, including testing facilitiesof theJapan Aerospace Exploration Agency, Russia's Star City (home of thecosmonauts),the New Mexico Museum of Space History, and NASA's Johnson Space CenterandAmes Research Center; she even tagged along on a simulated Mars roversojournon Canada'sDevon Island. Notunexpectedly, a chapter on the author's flight aboard NASA's former C-9parabolic training aircraft includes a photo of Roach floating inmid-air.Indeed, at no point will readers forget that Roach is writing a bookaboutspace exploration: She inserts herself into the story often, evencomparing aspaceflyer's detailed schedule to a book tour, and throughout devotingmany linesto the circumstances of her interviews. Roachadmits in the acknowledgments, that she has "no background in space oraeromedical matters," an admission that should raise some eyebrowsamongthe seriously interested. However, for the most part, she's done theresearchand discusses science solidly. Takinginto account the non-specialized audience that clearly represents hertarget, Roachincludes brief explanations of black holes, zero gravity, and basicphysicsprinciples. However, her faith in the reader's attention span is suchthat shelaments that an explanation of gravity will have likely been forgottena fewpages later. After all, what ordinary person could bother to comprehendgravity? Ofcourse, Roach builds suspense before answering the perennial favoritequestion:How do astronauts go to the bathroom in space? Theauthor keeps readers hanging until almost the last chapter, but whenherexplanation finally comes, no detail is left unexplored. Much hilarityensuesfrom the graphic description of outer space elimination using zero-gtoilets. Inmostcases, Roach's deadpan approach to space exploration allows theinherent humorof the field's absurd experiments to come through. Yet at times shepeppers thediscussion with intermittently funny jokes in the manner of a standupcomediantrying out new material. Many pages sprout tangential or even off-topicfootnotes, scavenged from the author's research with the fervor of ananxious dinnerdate lobbing conversation topics at the first sign of restlessness. Thoughshedid due diligence research in most areas, Roach hasn't included thevoices of anyrepresentatives of the now-burgeoning private spaceflight industry,which isexpected to launch people into space in upcoming years. Conversationswith VirginGalactic's Sir Richard Branson, SpaceX's Elon Musk and others couldhave madefor colorful copy. Theauthor fills her prose with breezily conversational phrases such as"It's my Wha?face," regarding Roach's reaction to Japanese toilets, or, in responseto viewingSylvia Saint in the infamous Uranus Experimentpornographic film: "Withoutgravity, there should be no hangy-downy." Ultimately,though the author's presence looms over the book, a sense of obligationon herpart also infuses the proceedings. By the final page, when she mildlyassertsthat our country should pursue Mars exploration with the concludingphrase,"Let's go out and play," that exhortation that seems less like aclarion call for discovery, and more like a student's sigh of relief atthe endof the term.